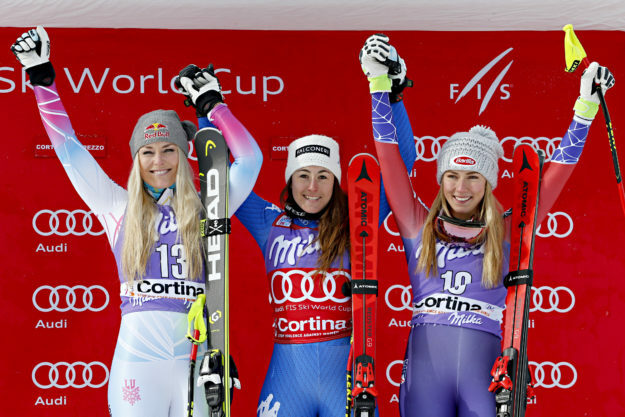 Lindsey Vonn (Vail, Colo.) and Mikaela Shiffrin (Eagle-Vail, Colo.) finished second in third respectively in Friday’s FIS Ski World Cup downhill in Cortina d’Ampezzo, Italy. For the first time in World Cup history, two ski racers from the Vail Valley stood on a downhill podium in Cortina, Italy, as Lindsey Vonn finished second and Mikaela Shiffrin took third. Friday’s race was won by Italy’s Sofia Goggia. Vonn, hunting her women’s record 79th career win and the fastest in both training runs this week, trailed Goggia by a little under a half a second. The red-hot Italian racer, who also won last weekend in Bad Kleinkirchheim, Austria, claimed victory Friday with a time of 1 minute, 36.45 seconds to 1:36.92 for Vonn, who has won at Cortina 11 times in the past. Vonn was clearly in the driver’s seat to achieve her 79th career World Cup victory on one of her favorite downhill tracks. However, she got caught up in a rut two-thirds of the way through her run and pulled out a dramatic one-ski recovery to not only remain upright but also hold her speed and push to the finish. “I caught my edge, the light was flat and that happens,” Vonn said. “I’m happy that I kept fighting to the end. I was hoping that I didn’t lose too much time, but unfortunately, it was enough to lose the win. Shiffrin, formerly a tech event specialist who just got her first downhill win this season at Lake Louise, was another third of a second back at 1:37.29. Shiffrin, meanwhile, added to her overall World Cup lead and is second in the overall World Cup downhill standings as she continues to make huge strides in mastering the speed events with her second downhill podium finish of the season. Goggia beat Vonn twice last March during test events on the downhill course at Pyeongchang, South Korea — site of next month’s Winter Olympics. And Shiffrin is clearly now a factor in the speed events of downhill and super-G. She continues to lead the overall World Cup standings by a wide margin. Cortina hosts another downhill Saturday and a super-G on Sunday. CORTINA, Italy (Jan.19, 2018) – After a storied 18-year career, Olympic champion Julia Mancuso (Squaw Valley, Calif.) hung up her tiara and took a victory lap on Friday, January 19th in Cortina d’Ampezzo, Italy – which happens to be the first track she podiumed on in January of 2006. Mancuso will move on to the next chapter of her career in PyeongChang, South Korea – this time not on the mountain, but with the NBC Olympics team in PyeongChang. As a junior ski racer, Mancuso came blazing on to the scene – grabbing an American record eight Junior World Championship medals. A four-event athlete from the beginning, Mancuso started World Cup racing and was a NorAm champion at 16, competed in the Olympics at 17, set a U.S. record for Junior World Championships medals before she was out of her teens, and then started her twenties by capturing two World Championships medals. Mancuso’s first FIS Ski World Cup was in 1999, and her first World Cup podium was a super-G silver in Cortina. Known for her renegade style and her ability to perform on the big stage, Mancuso donned a tiara on the podium in 2006 and 2010 when she won Olympic gold and silver. First World Cup start November 20, 1999 – Copper Mountain, Colo.
Nicknamed “Super Jules” and often sporting superhero attire, Mancuso led a fun-focused, unconventional career, splitting her time between surfing in Maui and traveling the world chasing snow in the winter. In between, she captured more major event medals than any other American woman with nine – four Olympic and five World Championship medals. For Mancuso, it wasn’t just about fun on piste, though. In 2010, Mancuso proved to the snowsports world that she was one of the most well-rounded and gifted skiers, grabbing a third in the Extreme Verbier Freeride event. Growing up in Squaw Valley, California, Mancuso was always inspired by the mountain and had a love for freeskiing too. Mancuso’s passion for the remoteness of backcountry slopes and deep powder were a big reason she participated in friend and Austrian freeskier Sandra Lahnsteiner’s production Shades of Winter: BETWEEN. During the filming of the all-women ski film, she was able to fulfill a lifelong dream of skiing in Hawaii on Mauna Kea. Since she was 18 years old, though, Mancuso battled issues with her hip. Hip surgery after the 2014-15 season had Mancuso sidelined from World Cup competition for two full seasons, but with an extreme fighter mentality, she made her return to competition in St. Moritz, Switzerland in December of 2017. Mancuso looks forward to the next chapter of her career, where she will join the NBC Olympics team in PyeongChang. Mancuso will contribute features on a variety of platforms including The Olympic Zone – a nightly 30-minute show that airs on NBC affiliates – and will also serve as a reporter, covering venues and locations throughout the Games. Mancuso worked for NBC in a similar capacity at the 2008 Beijing Olympics. It has been an epic battle with my hip injury, and the past three years I have put everything into returning to competition at the highest level and the goal to reach my fifth Olympic Games. There have been really promising days during this challenging process, and I have kept my spirits up despite many who questioned or doubted me. Sadly, I haven’t found the progression to compete with the best in the world again, but I’m proud to have fought until the very end. It is with a heavy heart that I say goodbye to ski racing, but I do so with a full heart. I am so grateful for all the incredible opportunities I’ve been provided and the amazing friendships I’ve made along the way. I’d like to thank the U.S. Ski Team, GoPro, KT Tape, POC, Spyder, Squaw Valley, Stoeckli, and Swix for their unwavering support during the past few seasons. I’d also like to thank my family, sponsors, and my team for believing in me, my doctors and fans, and especially my husband who has supported me through these difficult times. I am happy that I got to ski my last race here in Cortina – one of my favorite stops on the tour. I had my first podium here, and now I get to say farewell. I’m excited to see where skiing and life’s adventure will take me next!